Moist flavor packed baked turkey meatballs are quick and easy to make at home and ready in about 30 minutes. Serve them as appetizers, snacks, or the main dish! Perfect for quick weeknight dinners. I use the ground turkey that has both white and dark meat because it has a higher fat content 85/15. Fat adds flavor to meatballs. The dark meat will lend a bit of extra moisture to the meatballs. Ground turkey breast with a 97/3 or 99/1 fat content can be used in a pinch, but the meatballs will be drier. Think about an overcooked whole turkey. I know everyone has encountered at least one of those in their lives. The breast is dry and needs a load of gravy to make it edible. The dark meat may be a little dry, but still edible without gravy. Using ground turkey with both white and dark meat will give these meatballs the best chance. Ground turkey comes packaged in 1 pound to 1 1/4 pound packages. I prefer the brand that comes in 1 1/4 pound packages in my area. Either option will work and the extra 1/4 has not made a huge difference for me. I might get an extra 6 or so meatballs. Ground turkey can be kind of bland when used in meatballs, burgers, and meatloaves. Buttermilk will not only add moisture it will add an extra layer of flavor and saltiness. Regular milk can be used but I would bump up the salt just a tad in my meatballs. Ground turkey needs plenty of seasoning, but you have to be careful not to overpower the turkey either. 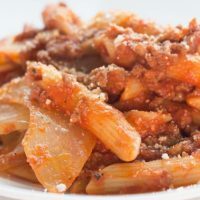 Minced onion and garlic can be used as a substitute. I like more consistency in flavoring so I stick to the powdered versions. Sometimes onions and garlic can be pretty powerful. Before baking the whole batch make sure you test fry a meatball first. You can add extra herbs if you like. Always test fry one before baking off the whole thing! It’s easy to test fry the meatball mix, just spray a small skillet with cooking spray or add a teaspoon of oil. Heat the skillet over medium-high heat, take about a teaspoon of meatball mixture and flatten it into a tiny patty and give it a quick fry on both sides. Now you can taste your meatballs. The easiest meatballs for me to form use regular kind of breadcrumbs. Italian breadcrumbs are my preferred “regular” breadcrumbs. Panko would be my next choice. 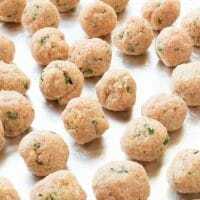 Italian breadcrumbs have a few added ingredients but overall won’t affect the flavor of turkey meatballs if all you have is on hand is plain breadcrumbs. I usually have both on hand but sometimes find myself without Italian and have used plain more than once with my turkey meatballs. Panko breadcrumbs are a bit crunchier than regular and Italian breadcrumbs. 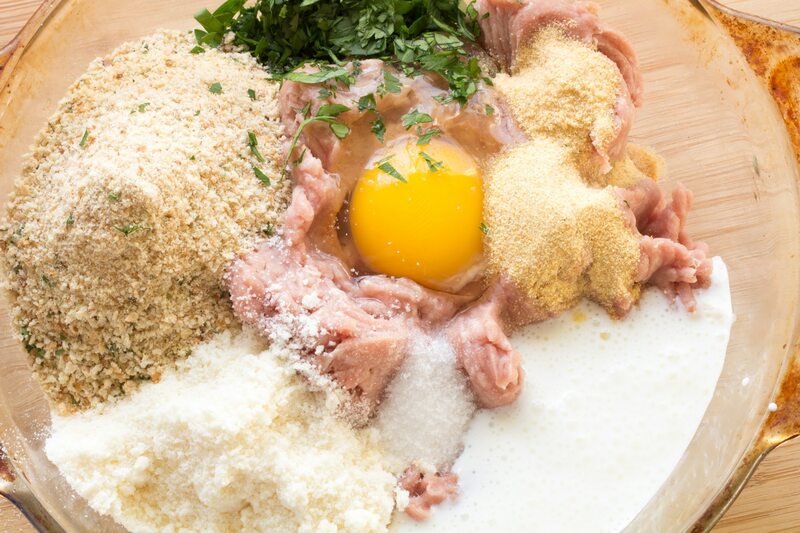 When using panko breadcrumbs, soak the breadcrumbs in the buttermilk for a few minutes before adding them to the meat mixture. This will ensure that there are no crispy bits left in the cooked meatballs. Whenever I need to make any type of gluten-free meatballs I substitute ground Rice Chex for the same amount of breadcrumbs called for in a recipe. I soak the Rice Chex pieces in buttermilk for a few minutes before adding to the turkey mix. Gluten-free bread can be dried out in the oven and ground up fine, but I find that Rice Chex is a cheaper alternative. Have you priced out gluten-free bread in a store lately? I have. We have a friend who is beyond gluten intolerant, he has a flat out wheat allergy. I have had to learn how to make dishes gluten free without stocking the pantry full of expensive items I might only use 8 times a year. I use my cookie scoop to keep the meatballs uniform in size. I use my #60 scoop for small meatballs. This is the size used for the photos and recipe testing. A #60 will make about 48 meatballs. These will be about 1-inch. I use a #40 scoop for larger meatballs. Using the larger scoop gives me about 28 to 30 meatballs. Stepping up to a #60 will make somewhere around 16 meatballs. These bad boys are going to need quite a bit more baking to make sure they are completely cooked in the middle. I only make them this large when I am being lazy and plan to finish them off in a pot of spaghetti sauce. Ground turkey needs to be cooked to 165⁰F before it is safe to eat. I like to scoop all of my meatballs onto a prepared baking sheet all at once. Then I come back behind and roll the mixture into balls, spacing them out as evenly as possible once the meatballs are formed. Alternatively, you can use your hands and make the balls as close to the same size as possible. Working with raw ground turkey requires avoiding cross contamination. After working with raw ground turkey, thoroughly wash your hands and make sure to get up under the fingernails. Raw poultry has a higher risk of salmonella than other raw meats. Cooked turkey meatballs can be stored in the refrigerator for up to 4 days. They can be stored in the freezer for up to 3 months. 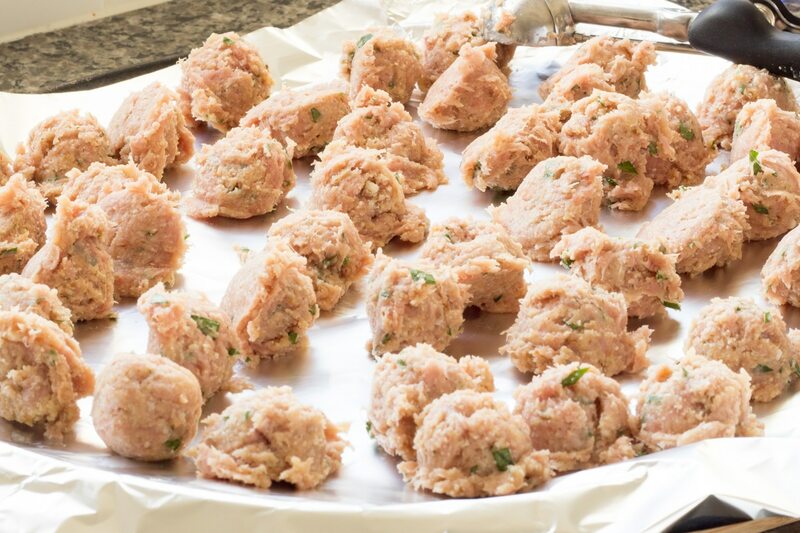 Raw turkey meatballs should not be stored longer than 48 hours in the refrigerator. If you are not going to bake them in that amount of time stick them in the freezer. 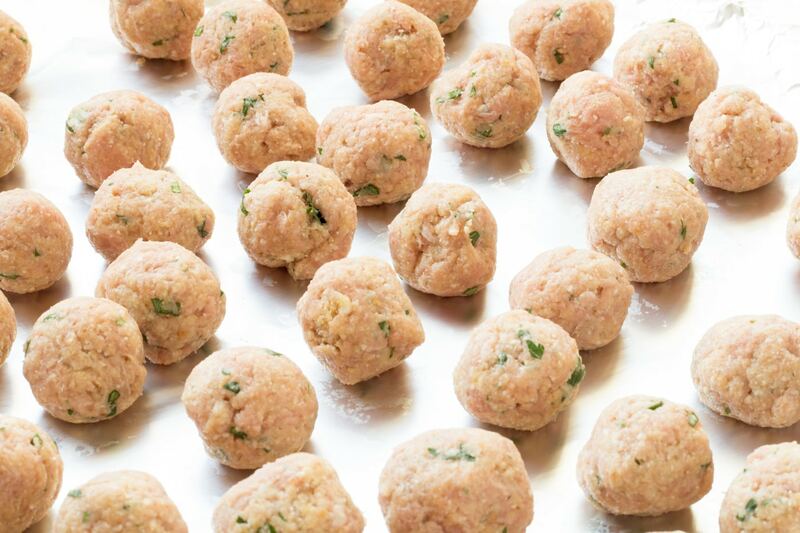 Raw turkey meatballs are safe in the freezer for up to 4 months. Reheat the meatballs by placing them into a preheated 350⁰F oven for 10 to 15 minutes or until the center of a meatball tests 165⁰F. To microwave leftover turkey meatballs, place up to 4 them a plate in a single layer and reheat for 30 to 60 seconds or until they have reached a safe temperature. Leftover meatballs can also be simmering in a sauce until the reach 165⁰F. See a pattern here? Whatever method you choose for reheating leftover turkey it always needs to reach a safe temperature. 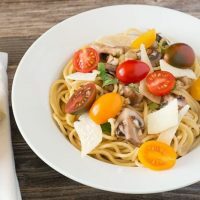 Weeknight meal ideas perfect for those crazy busy nights. 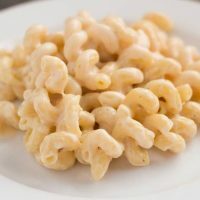 Quick and easy meatless pasta dish featuring loads of garlic. 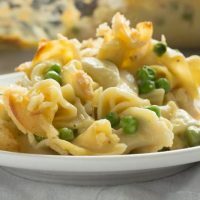 Quick and easy creamy chicken and noodle casserole, perfect for weeknights. Kid-friendly. 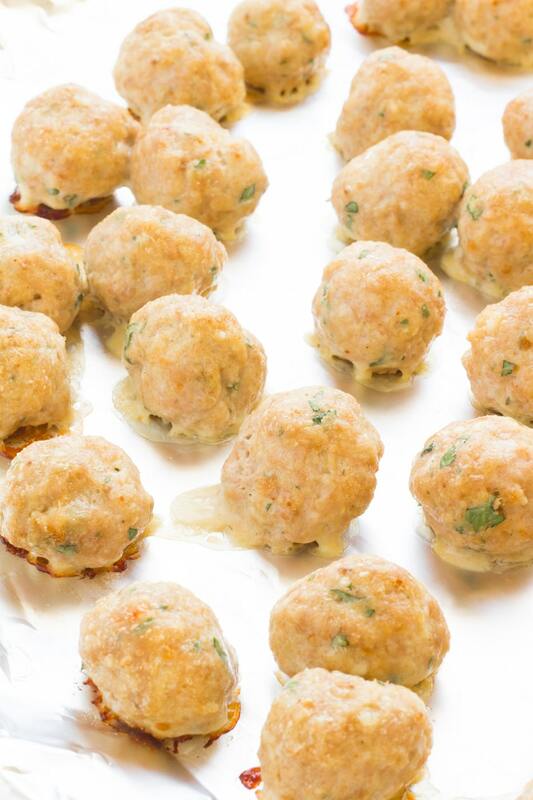 Moist baked turkey balls are perfect anywhere you use meatballs. Set mixture aside for 5 minutes to allow the breadcrumbs to absorb some moisture. Prepare a baking sheet by spraying with baking spray or covered with a non-tick foil. Form meatball mixture into 1 inch balls. Place meatballs onto baking sheet. Place into preheated 375 Degree F oven and bake for 20 to 25 minutes or until meatballs are cooked competely through with no pink. 1 Tablespoon of dried parlsey can be used in place of fresh parsley.